This month we will be journeying through the differing ways that God has been faithful to His Church, and will also be celebrating ways that He has been faithful to our particular church. It is important, within our modern day in age, to look first at the reason for the Church, and the scriptural mandate for God’s people to gather in worship and instruction on an ongoing basis. I fear that the Reformation era moniker “Sola Fide!” or Faith Alone, has been misconstrued within the Evangelical church to minimize the importance of the gathered body. Yes! We are justified by having faith in Christ alone, and I openly declare that the Church does not influence the act of justification within that regard. However, we simply cannot practice Christianity individualistically, but rather must practice our Christian faith within the realm of real relationships, and most notably within the gathered Body of Christ. As such we will look to the Scriptures to inform us on the importance of the Bride of Christ, and the avenues that God utilizes His Church to further His redemptive purpose. In Ephesians 5:24-27, Paul beautifully likens the relationship of a husband and wife to that of Jesus and His bride, the Church . This is not the last illustration within the Scriptures that reminds readers that the Church is Christ’s bride, but also John describes the unification of the bridegroom, Christ, with His bride, the Church, upon the consummation of the Kingdom when Jesus returns (Revelation 19:6-8; 21:1-2). “Hallelujah! For our Lord God almighty reigns. Let us rejoice and be glad and give him glory. For the wedding of the Lamb has come and his bride has made herself ready. Fine linen, bright and clean, was given to her to wear” Revelation 19:6-8, NIV. Within this imagery we can understand the high view that Jesus places upon the Church. And yet, we oftentimes minimize the importance of attending the weekly worship gathering. Time after time other things in life take precedence over gathering with God’s people to bring corporate worship unto Him. How then can we be assured of our justifying faith if we refuse to fully invest within the local church? Again, the Church is the Bride of Christ, and if we liken this to human marriage, I would venture to guess that few people would tell a man that they really like him, but hate his wife. But this is what we do when we minimize the importance of the Church within the growth of Christians, and the primary means of the practice of our Christian faith. The Church is a means of grace that God has imparted on each and every Christian. Within the Church one hears the Word preached, participates in the ordinances prescribed by Christ—communion and baptism—and brings praise to God through singing and worship1. Moreover, membership within a local church body brings about accountability to church leadership, and reciprocates this action towards the leadership1. Membership instinctively pushes you to be more involved in the body through serving, and giving back to the congregation. From this we can understand the servant nature of Jesus’ earthly life, and capture a glimpse of Christlikeness within our Christian faith. Finally, the Church is the visible expression of the Gospel1. Let me make one thing clear, we cannot live out the Gospel, Jesus did that for us, and that work is completed. However we can live in the light of the Gospel, and oftentimes this is expressed visibly through the life of the Church. The Gospel is visible when the Church imparts right preaching, right practice of the ordinances, and the Church is rightly involved within the transformation of the local community1. A famous worship song states, “They will know we are Christians by our love,” and this is the true mark of a Gospel-visible church. Furthermore, Jesus states, “By this everyone will know that you are my disciples, if you love one another” (John 13:35). Does the local community know we are Christians by our love? Do they know more about what we are for, rather than what we are against? And how do we convey this? 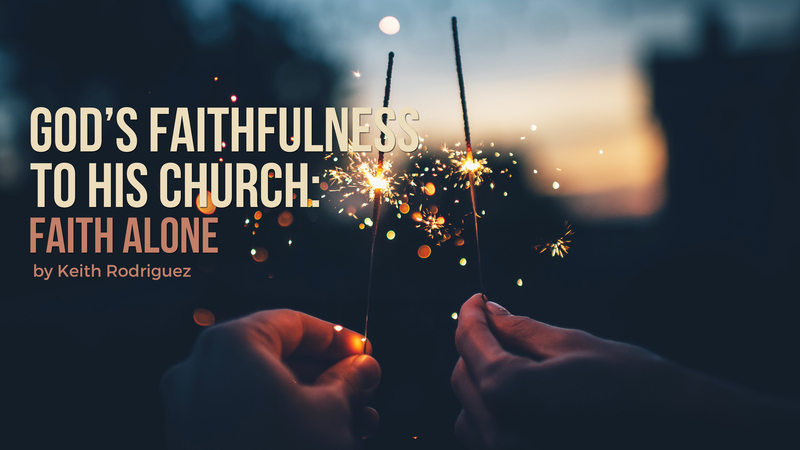 As we journey through God’s faithfulness to the Church, we begin with the Church itself, and the importance of the Church within the life of a Christian. It is not merely “Sola Fide!” that brings growth to Christians, but the practical application of our faith through the life of the Church. This is how God has always worked, and I fear that within the individualism that is ever-present within our society that we will grow further and further from understanding the importance of the Church within the practice of our faith. As such, I urge you to be committed, to be involved, to be transformed, and to be invested in the local church body, and within this, you will truly understand the faithfulness that God has and will continue to have towards His Church. 1Mark Dever, “The Church,” in A Theology for the Church, ed. Daniel L. Akin (Nashville, TN: B&H Publishing Group, 2007), 766-856.